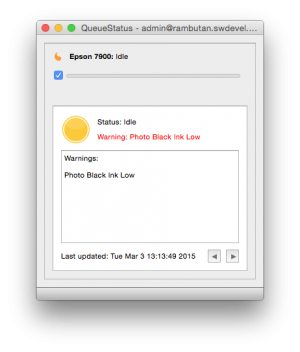 Serendipity Blackmagic / Megarip 6.0+ adds a Printer Status Monitor option to the Serendipity Client, allowing the QueueStatus module to display the current status, ink levels, warnings and error messages of a printer. Green, Orange and Red indicators show if the printer is in a nominal, warning or error state. Arrow buttons (bottom-right) allow the user to cycle through specific printer message details. 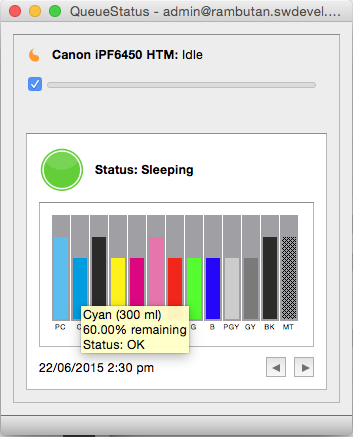 Hovering the cursor over an Ink channel or Maintenance Tank bar will show a tooltip with the ink name, cartridge size, status and % amount of the ink remaining. Printer disconnected from network or turned off – every 5 min until connection is restored. 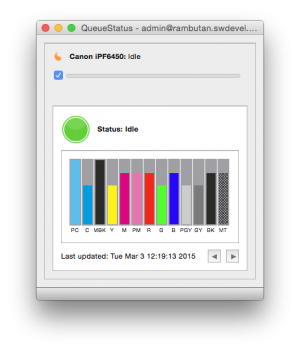 Printer Status information can be updated manually at any time by de-activating and re-activating the printer Queue using the tickbox in the QueueStatus panel. 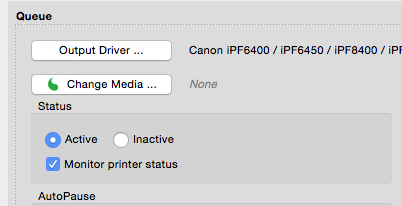 If the printer driver allows monitoring, check to the Monitor printer status tickbox in the Queue panel of the Output, then Save. In the Jobs application (or stand alone) QueueStatus module, use the Change Queue contextual (right-click) menu option and select the Output. 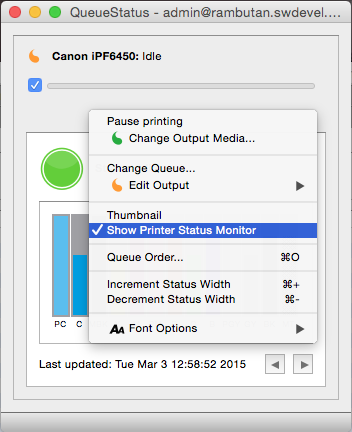 Select the (now enabled) Show Printer Status Monitor option from the contextual (right-click) menu. This entry was posted in Blackmagic, HowTo, Megarip, Modules, Printing, Serendipity Client, Workbench and tagged Version 6.0+. Bookmark the permalink.